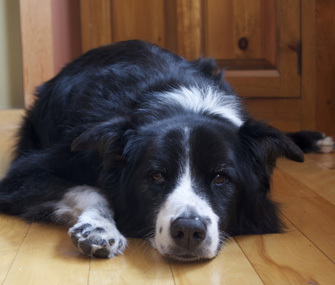 Your dog or cat may be anemic if he's weak, tired and uninterested in his usual activities. It’s important to understand that anemia itself is not a disease — it is a sign of an underlying problem. So when your veterinarian says, “Your pet is anemic,” he or she is likely going to be looking for the exact reason why. The interesting thing about anemia is that it can occur through a variety of mechanisms, all of which result in an inadequate number of red blood cells in circulation in your pet’s bloodstream. If your pet is producing enough red blood cells to meet normal demand, then everything is working well and there is no problem — your pet’s organs and tissues will receive the proper amount of oxygen, and carbon dioxide (a waste product) will be removed. These are the functions of a healthy red blood cell. However, let supply fall or demand increase and you have a red blood cell crisis on your hands. This article will attempt to explain some of the various reasons why this can occur. In order to understand anemia, it may help to think of red blood cell production in terms of a manufacturing process. Bone marrow is essentially the manufacturing plant for red blood cells. The “order” to produce more red blood cells comes from a hormone secreted in the kidneys — erythropoietin. When the body’s supply of red blood cells drops and the kidneys sense a decrease in oxygen, they meet the demand for more red blood cells by producing erythropoietin. This in turn tells the bone marrow to ramp up red blood cell production. But in order for the bone marrow to manufacture red blood cells, certain raw materials, including vitamins and minerals like B12, copper and iron, are required. When the supply chain of these materials falters for some reason, anemia can result. When a pet becomes severely anemic, all body systems can grind to a halt due to inadequate oxygen delivery. Without adequate oxygen delivery, your pet may be weak, tired and uninterested in his usual activities. You might notice his normally pink tongue or button nose is pale. Because anemia generally occurs as a result of another disease, you may also see signs of the underlying problem — for example, excessive drinking and urinating in a cat with kidney disease or vomiting in a dog made anemic by the ingestion of onions or garlic. Let’s take a brief but closer look at some of the many ways the red blood cell process can break down and result in anemia. As we discussed above, without the raw materials, or building blocks, of red blood cells, the bone marrow cannot replace them. Iron deficiency anemia is the classic example of a supply chain failure. Although this type of anemia is common in humans, the typical, commercially available pet diet is replete with iron and the diagnosis of iron deficiency anemia is relatively uncommon in pets but does occur. Cobalamin, or vitamin B12,is another essential ingredient for red blood cell production. In dogs, a congenital disorder in Giant Schnauzers, Beagles, Border Collies and Australian Shepherds can lead to B12 deficiency and result in stunted growth and anemia, which can be reversed by B12 injections. These are two examples of anemia caused by insufficient raw materials. The bone marrow is one of the few organs in the body with the capacity to self-renew, even in adults. The marrow contains red blood cell stem cells. Stem cells, throughout an individual’s lifetime, retain the ability to divide and produce replacement red blood cells. Damage to the stem cells from drugs like chemotherapy agents or a decrease in the kidney’s ability to produce the red blood cell stimulating hormone, erythropoietin, can shut down manufacture of red blood cells in the bone marrow. Occasionally, the bone marrow itself develops a disease in which the stem cells stop producing adequate red blood cells, causing anemia. When bone marrow shuts down, we call that disease “aplastic anemia.” These are examples of anemia caused by inadequate production of red blood cells.